All Pitzer’s core values spoke to him, but the one that resonated most was Environmental Sustainability. “My passion and concern for the health of our environment is immense,” said Zamora, who is the first person in his family to graduate from high school. 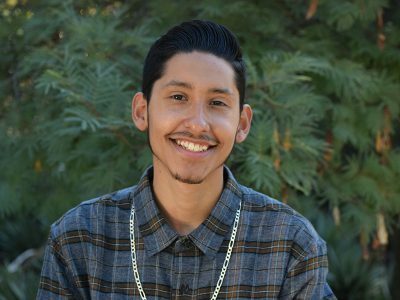 Three years after his campus tour, Zamora is studying environmental analysis and policy at Pitzer. His ambitions go far beyond earning his diploma in 2021: he hopes to head up the US Environmental Protection Agency one day. He’s already on his way. During his first year at Pitzer, Zamora was selected as a W.M. Keck Foundation Scholar. The W.M. Keck Foundation Endowed Scholarship, which supports four academically strong Pitzer students each year, reflects the Foundation’s belief that a high-quality, well-rounded education is vital for tomorrow’s leaders. Zamora is also a bike mechanic for Pitzer’s Green Bike Program, a student-run initiative that promotes cycling and sustainability at The Claremont Colleges. Over the coming years, Zamora plans to continue to find ways to translate Pitzer’s core values into his work in the world. “I enjoy giving back to my community in any form possible, whether that’s a small or large contribution,” he said. To find out more about the W.M. Keck Foundation Endowed Scholarship, visit Pitzer’s Named Endowed Scholarships web page.